The Modular Drive System, MDS, is a power house of velocity and torque. There are 5 performance matched, drive module sizes available. 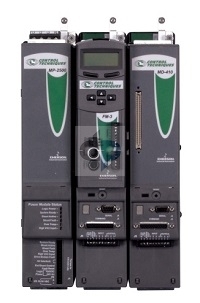 MDS servo drives can operate on a 230V or 460V AC input, and they support a wide range of industrial communication protocols. This servo system is comprised of a common power module that can accommodate up to 8 modular drives. The power module consists of an innovative, pre-fused, backplane that the drives connect to. The power module is equipped with a single AC input, and generates DC bus power for the entire drive system. Power modules are available in 3 ratings for absolute optimization of power. Extend control capabilities of your base drive with the addition of a Function Module (FM Module). These modules easily snap directly to the front of your MDS drive. There are 7 drive enhancing FM Modules available for all levels of indexing, programming and communications. A complete array of optional accessories includes: shunts, line filters, brake relays, motor power, brake, and feedback cables. Experience "Motion Made Easy" with a Modular Drive System today!